The material is grisly and fascinating. You aren't asked to wallop in the blood. Although, let's face it, the blood is there. A deranged killer who preys on boy prostitutes is certainly unique material for a thriller. The period recreation is superb. And the ensemble acting is superb, too. 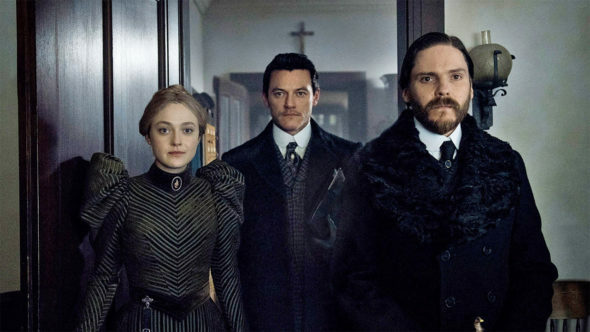 But the principals do shine - Daniel Bruhl, Luke Evans and Dakota Fanning. I've been watching this, too. As you say, the production design, costumes, settings, are all wonderfully done, even if things occasionally look overstuffed and dreary, which is fitting. I've been waiting for an adaptation of this for many years, as a movie was discussed for a long time without ever materializing. I was excited by the cast, too. I've grown to appreciate Daniel Bruhl thanks to several of his roles in movies like Goodbye Lenin!, Rush, Inglourious Basterds, and Captain America: Civil War. At first I didn't warm to him in this show. Something about his voice sounds as if it was all redubbed in post-production. But his character has grown on me, and while he's still not very likable, he at least seems more 3-dimensional. And were my eyes deceiving me or is his right arm supposed to be shriveled and near-useless? I've liked Dakota Fanning since she was very little, and I thought she was one of the best child actresses I'd ever seen. I wasn't sure how I would take her in this adult role, but she's been acquitting herself well. Luke Evans has also been very good as the conflicted artist. His character seems to have the most depth so far. Brian Geraghty's Teddy Roosevelt has been good. I'm not crazy about Ted Levine's corrupt ex-police chief. His accented, mush-mouthed vocalizing has made it hard to decipher what he's saying at times. And I was pleasantly surprised last week, during the opera scenes, to see my avatar for this week, Michael Ironside, playing JP Morgan. That underground world of boy prostitutes is a very scary one. The scene in Episode Two where the boy prostitutes reigned supreme was such a forbidding one. I can still remember that line from one of them, "I can make your dreams come true." I think it was said by the boy who was known as "Sally". "We do things girls don't do."